This simple, elegant, and functional Dressage, Naturally Bitless Bridle was designed by Karen. Made from quality english bridle leather, it has all the refinement and quality of a dressage bridle, with the fit of a comfortable halter, and the functioning of an excellent tool of communication. Now available in Havana Brown and Black! It comes in one size that fits a small horse up to a warmblood (see sizing info below). The design of this bitless is such that the cheek pieces will stay well away from the horse's eyes without having to over-tighten the noseband and/or jaw strap. Scroll through photos to see the view that shows how loose it can be around the nose. It is very adjustable, allowing a more custom fit for a wide range of horses. The noseband is detachable to allow for other noseband options without having to buy a whole new bridle! "I was frustrated by other bitless bridles on the market. I (and my horses) did not like the ones that have straps that cross under the head, or that tighten down on them. With some other designs, the cheek pieces often got too near the horse's eyes, unless the noseband or jaw straps were really tight... That went against my preference to allow horses freedom of movement in their jaws! I loved the way my rope halters fit on them, but I wanted a nose-piece that was more 'connection-friendly' than thin rope with knots for when my horses are at the stage where they are sustaining their working gaits. "I also wanted a design that could fit a range of horses. 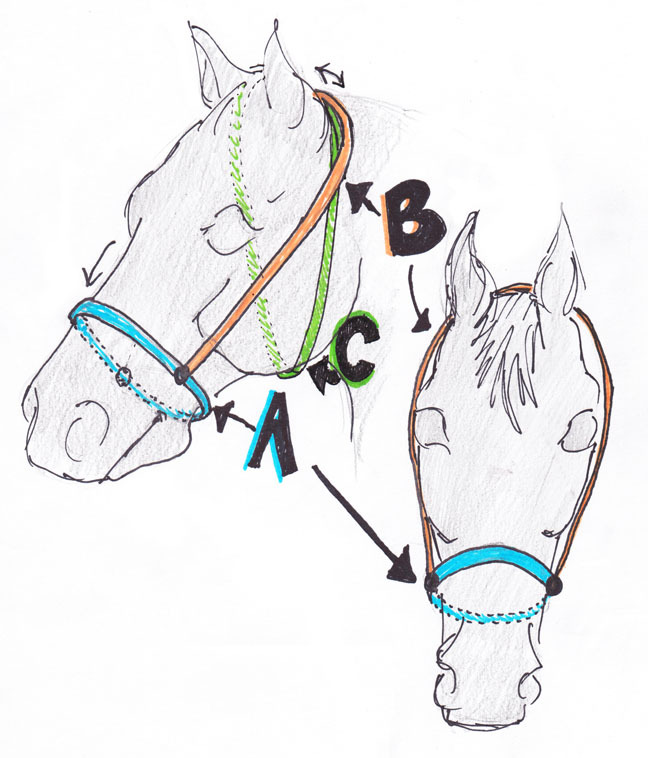 I'm currently developing other noseband options, and with this design, you'll be able to switch out the noseband without having to buy a whole new bridle... I am really happy with the result, and it seems my horses are too!" First: find the mid point between the corner of your horse's lips and his jaw (where your noseband will sit). DISCLAIMER: As with any piece of equipment, this Refined English Leather Halter will not perform miracles, and will only be as effective as the person using it. It is designed to allow a comfortable bitless connection with your horse, and is meant as a refined riding tool with horses who have been properly prepared. It is not designed as a tool for controlling horses who have not yet been properly trained. It is not a lunging cavesson or stable halter and was not manufactured to perform as such. In no event shall Dressage Naturally or Temenos Fields Inc. be liable for any direct, indirect, punitive, incidental, or special consequential damages to property or life, whatsoever, arising out of or connected with the misuse of our products.